Major cities such as San Francisco, Washington D.C., LA, Chicago, New York, Houston and Philadelphia may convert the serviving newspapers into nonprofits to keep their political and philanthropic status. The San Francisco Chronicle will be the first to test the entity. San Francisco investment banker Warren Hellman and other prominent SF lawyers and investors made an informal proposal last week to Hearst, owners of the San Francisco Chronicle about helping the troubled daily paper become a nonprofit, San Francisco attorney Bill Coblentz told the SF Business Times. Hellman and Coblentz discussed the idea, then Coblentz conveyed it to former San Francisco Examiner editor and publisher William R. Hearst III, who is a Hearst Corp. director and an affiliated partner with Kleiner Perkins Caufield & Byers. William is one of the working Hearsts who lives in the Bay Area and keeps touch with The Chronicle on a daily basis. It’s unofficially the Hearst flagship, though in money making ability, their Houston Chronicle is by far the financial headquarters. “What happened after that, I don’t know,” said Coblentz, who is out of town. The proposal would be for a nonprofit corporation “to take over the Chronicle,” with Hearst Corp. continuing to provide some philanthropic support, Coblentz said. Details remain sketchy. It’s unclear if the proposal is being seriously considered. Editorial-wise they are already PBS in print, aren’t they? The decline of the newspaper media monopoly never slows. If you have any stock in newspaper-heavy media, it’s too late to get out. As of the end of 2008, 30 daily newspapers are for sale. Buyouts were the good old days. Now there are brutal Christmans-time layoffs. Google the Gannett Blog and find a running count by an ex-Gannetter. The layoffs and firings that started this week at newspapers owned by Gannett, including at the flagship USA Today, have been especially ruthless, in addition to being timed just weeks before Christmas, they number in the thousdands. But why not? These are mainly socialists and athiests who mock families and call moms breeders. It’s bloody news for newspaper journalists. Even the sill profitable Gannett newspapers (many still have profit margins at 20 percent) are shedding employees at a breathtaking rate. This week a Gannett spokesperson said the cuts are being managed locally, at each newspaper, which is why as a company they’ve not released figures on specific jobs other than to say it’s a 10 percent cut companywide. While early figures compiled paper-by-paper totaled 1,700 Gannett jobs cut, it looks like that number may well pass 2,000 by next week. In just the past week several thousand newspaper employees in America have lost their jobs, Cox Newspapers announced the closing of their Washington, DC, bureau, and the Tribune Co. will lay off more people at their flagship paper in Chicago. In Chicago the credit analyst Fitch Ratings predicted that the continued decline in advertising revenues will cause some newspapers to default on their debt in 2009, and rated the debt of two huge newspaper companies – The McClatchy Co. and Tribune Co. – ask “junk.” Fitch also predicted that several cities could find themselves without daily print newspapers by 2010. As many as 1,700 Gannett jobs were cut this week, from assistant managing editors on down, including reductions of up to 31 percent of the staff at one newspaper, The Salinas Californian, according to a reader tally on a blog published by a former Gannett worker, Jim Hopkins. The most recent E&P (an online Web site on newspapers that ironically ended its print edtions a decade ago) reports that recruitment advertising declined in May. The Newspaper Conference Board, which measures job ads in 51 print newspapers across the country, said its Help-Wanted Advertising Index is 33. It was 38 one year ago. “This is certainly a more negative picture going into the second half of the year, compared to the beginning of the year,” Ken Goldstein, a labor economist at the Conference Board, said in a statement. In the last three months, help-wanted advertising fell in all nine U.S. regions. The Dallas Morning News (a monopoly) said today it’s going to offer buyouts to the newsroom. That means waving a modest proposal of a few extra weeks of severance pay in front of the noses of older employees. Reality check: the UAW buyouts give auto workers 90 percent of their pay and free health care for life. I was walking my dog this morning at 5:30 a.m. and watched a newspaper carrier in a junk car speeding around my neighborhood to drop a paper at every 20th house or so. Just a few years ago, 40 percent of the homes subscribed to the paper. Imagine the carbon footprint of that old smokestack medium. The New York Times is a daily promotional newsletter for the elite liberals and Democrat party. The high paying positions are filled by family members and friends from the inner circle of the Democrat party. A former speech writer for Bill Clinton rejected an Op-Ed letter from John McCain, while printing Obama’s letter in full the week before. Take a look at the CEO, publisher and executive editor positions at the New York Times. It’s all in the family. And one of the biggest jokes on Wall Street, their stock is like the Democrat’s super delegates, the Sulzberger family has voting rights while all the other stockholders do not. That assures that Pinch Sulzberger stays highly paid as CEO and publisher of the crumbling empire. Pinchy gets to travel to Devos, Switzerland to discuss economic issues on the non-voting stock holders’ dime. (Devos is one of the most expensive resorts in the world). Why isn’t the NYT practicing affirmative action? Appoint Jessie Jackson or Al Sharpton as publisher or at least on the board of directors. Practice what you preach, affirmative action where it counts. One new director, Dawn Lepore, served as a director of Wal-Mart from 2001 to 2004. While Ms. Lepore was serving as a Wal-Mart director, along side Hillary Clinton, the Times was denouncing Wal-Mart for a series of supposed sins. The other director is from “Big Oil.” Google it if you don’t believe me. The Washington Post created a media group and a high paying job for family member Katharine Weymouth, part of the Graham family. Weymouth is the niece of CEO Donald Graham. A new generation of the Graham family is taking a lead role. Katharine Weymouth, niece of chairman and CEO Donald Graham, has been appointed CEO of Washington Post Media, a new unit that includes the paper and Washingtonpost.Newsweek Interactive. This should bring the business sides closer together, perhaps even integrating them, but the newsrooms will remain distinct. She also becomes the fifth member of the Graham family to serve as publisher, returning the family to that post as she succeeds Boisfeuillet Jones, Jr.; he is now vice chairman of the company and chairman of the Washington Post (NYSE: WPO). The Washington Post is actually getting some heat for its elite liberal act. 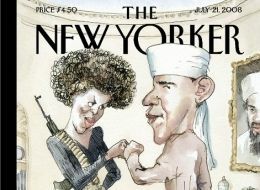 The cover shows Michelle Obama giving Barack (who is dressed in Muslim jihadist garb) a terrorist “fist-pump” similar to the SLA. The American flag is buring in the fireplace and there is a portrait of Osama bin Laden on the wall. Blasphemy. Kill the cartoonist! This is an insult to the Democrat party and Islam! How many nasty covers made fun of Bush, Cheney, Nancy and Ronald Reagan, Newt Gingrich and Dan Quale? Plenty. But that is to be expected. The New Yorker cartoonist and editors are laughing at all the attention the elite, liberal, well-written, (but poorly read) weekly magazine is getting. The joke is, that’s what they think Republicans think of Obama. Not quite, we think of him as a “progressive” socialist selling the same old FDR, LBJ, quasi-communist, class warfare propaganda. He’s a Chicago ward politician with less than 150 days of experience as a U.S. Senator.